Data analytics is the most valuable tool in the digital marketplace – so much so that organizations are employing high performance computing (HPC) capabilities to rapidly collect, share, and analyze endless streams of data. Superior levels of performance and compute capacity are paving the way to greater intelligence and enabling organizations to glean faster, more accurate insights. Today, developers are designing innovative HPC solutions to empower a new breed of data analytics. Artificial intelligence (AI) is the ability of machines to recognize trends, patterns, and associations based on inputs from immense datasets. By synthesizing past and ongoing experiences, AI algorithms are trained to make decisions, much like the human brain. Success in AI means leveraging enough compute power to fuel real-time, high-level analytics. Thus, advancements in HPC are becoming increasingly vital to AI, delivering the speed and performance required to drive scientific discoveries, weather predictions, personalized medical treatments, and business-critical decisions. HPC and AI convergence is driving a major paradigm shift in computing and analytics. As the line blurs between the different types of workloads, data scientists, researchers, and product engineers are harnessing leading-edge tools and capabilities to execute highly complex and compute-intensive tasks in real-time. Taming the data deluge – Organizations can increase data governance and reliability with HPC/AI technologies that are engineered for massive throughput and massive datasets. Fast, performance-optimized infrastructures are necessary to support the most demanding workloads. Speeding time-to-insight – By maximizing compute performance, agility, and flexibility, AI can complete workloads that would take years in just seconds, allowing organizations to reach critical decisions at breakneck speeds. Enabling enterprise AI – Organizations across all sectors are seeking faster, more effective ways to enhance product quality, understand customers behaviors, and predict the next natural disaster. Backed by HPC, AI is not only improving business outcomes, but also expanding the scope of human knowledge. The convergence of HPC and AI is revolutionizing the way organizations operate, learn, collaborate, and grow. However, many lack the extreme scalability, density, or expertise to harness the full potential of AI. In order to succeed, organizations need an environment that is optimized for massive scalability and performance to run any workload. The right technologies must ensure end-to-end high bandwidth and low latency, while creating a platform that can rapidly adapt to evolving HPC and AI requirements. 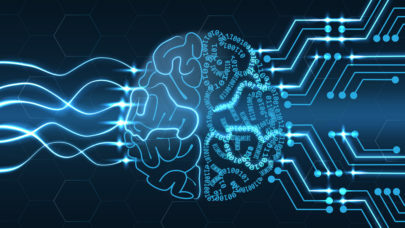 To support this transformation, capabilities from leading developers Hewlett Packard Enterprise (HPE) and Intel® are built to increase the speed and accessibility of AI technologies, and help organizations execute compute-intensive and data-heavy workloads to achieve breakthrough results. HPE Apollo systems are designed for high-speed, high-density performance with greater efficiency, making it ideal for a wide range of demanding tasks. Integrated with industry-leading Intel® Xeon® Scalable processors and Intel® Omni-Path fabric, HPE Apollo systems like the HPE Apollo 6000 Gen10 are workload-optimized to drive AI analytics at a lower TCO. These robust technologies allow organizations to operate quickly and accurately, with the combined power of HPC and AI. To learn more about the incredible business value of HPC and AI convergence, I invite you to visit me on Twitter at @pango. You can also check out @HPE_HPC to learn about the latest news and updates from HPE and Intel.